Good Enough for Tesla, Good Enough for Dealers? If you agree that Tesla Motors is a smart company, like’m or not.. keep reading. If not, I doubt you get too excited about this. Have you recently been on teslamotors? I was and I took notice to something. Simplicity. An image, 4 calls to action (CTA), one promotional statement, and a few navigation links at the top. No pop-ups. No drop-down menus. Nothing. Can this actually work? Count and compare the number, types of CTAs and promotional statements on an average dealership website. How does that compare to Tesla? 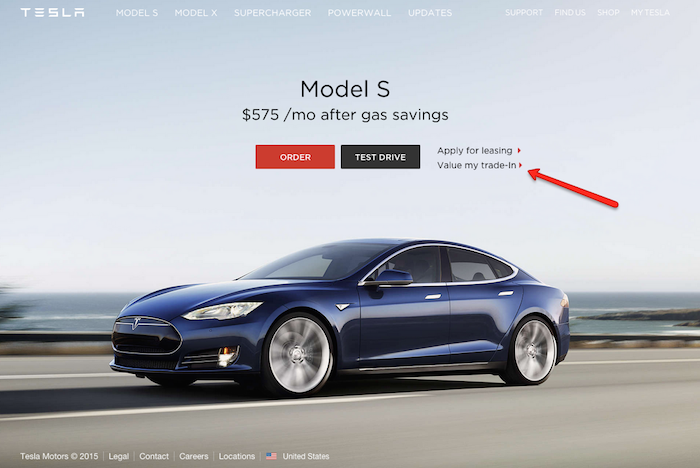 Tesla has distilled their customer’s online experience down to provide the most important answers to their customers most important questions. If you think about it, there really aren’t a lot of questions. Fortunately, all that time and effort putting inventory online is appreciated by a majority of our survey audience. Similar to last year’s results, other options break-down. So, the question here is: how efficient is your website at providing the answers to these questions? Or is your website causing potential issues in matching your in-store processes to what you represent on your website? No one wants to book a service appointment online, only to show up and find that you’re appointment was never placed on the schedule. Or the cost for the 40k mile service is $60.00 more than what’s listed online. Even worse is when you try to book your service appointment online and it takes you over 5 minutes to get half way through the online process. You get to the final confirmation page and there’s a conflict with mobile browsers, sending you back to the beginning to start all over again. Use that same logic when considering and adding a new tool to your website… like an online appraisal tool. The trade appraisal process always ends with an in-store conversation. Is your online trade appraisal process setting the stage for that conversation or is it inviting an unnecessary debate over a value and credibility of its source? In the end we’ve all seen the trend of simple is better and that is what Tesla is showing us. They are certainly a different car company but their customers are very much the same as ours. I’m also here to tell you that Tesla has room to improve. I clicked on their trade-in valuation CTA, only supported by a form fill which was rather disappointing, and then received a call telling me “it’s best to do this at the store”. Yes, I’ve put a call in to Tesla to improve that :). As we see online retail processes/systems/tools emerging on the market today and certainly part of our future, what things are you doing on your website or in the store to support the inevitable in-store conversation. Is this simple approach the way to go? Or, the pop ups, chats and 17 clicks to a VDP have numbed our consumers to accept that in the dealership world? Brice Englert is the CEO of TRADEPENDING and a passionate product innovator. After 10 years in the automotive industry buying and running companies, his record in new product launches has been stellar. His latest introduction, SNAP, solves one of the most important problems in the sales process - the trade value. SNAP uses real market data to best connect the in-store experience to the on-site experience. SNAP uses digital best-practices to harvest more organic leads from the dealers virtual showroom. Brice is known for his commitment to strong relationships within the industry and better hair than Jeff Kershner.